Summer programs like Camp Hope at Freedom UMC near Waldo keep youngsters fed and engaged in fun, educational activities. Photo from Freedom UMC. WALDO – Camp Hope is living up to its name. Nearly 30 children, ages 6 to 16, are enjoying a month of summer fun that likely would not happen except for dedicated church volunteers and a $2,000 award from the Alice W. Lockmiller grant program. The jam-packed schedule of activities from June 16 through July 24 includes Bible study, fishing, swimming, movies, skating, arts and crafts, an animal-rescue zoo, games and basketball. And for the first time, campers will take a field trip to the beach and sing in a choir. "It would be so hard to do this because the church and the community just don't have the funds," says Rev. Mary Jackson, pastor at Freedom UMC near Waldo and Greater Bell UMC, Brooker. 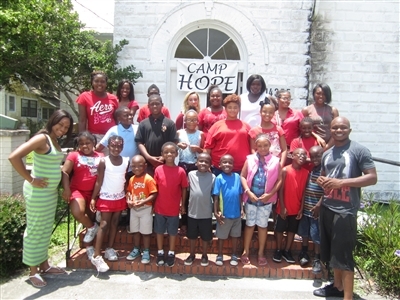 Every year churches and ministries like Camp Hope receive a helping hand through the Lockmiller grant program, which is administered by the Florida Conference from funds managed by the Florida United Methodist Foundation. 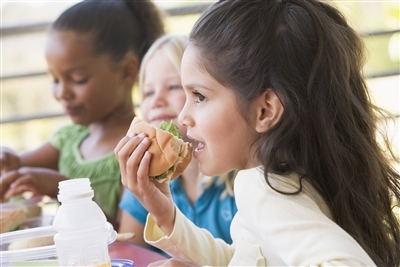 Cash incentives from $500 to $2,000 are awarded to programs that focus on at-risk children and families, with an emphasis on eradicating hunger. This year, $2,000 was given to each of 10 churches for summer feeding programs, school supplies, day care supplies, education enrichment, parenting skills education and physical recreation. First UMC, Fort Meade, received a $1,000 grant for a summer feeding program. And, for the first time, $2,000 was given for scholarships to enable young clergy to attend Florida Advocacy Days, an annual event in Tallahassee when Florida Methodists participate in Florida Children's Week. The grants are distributed from a charitable trust honoring the legacy of Lockmiller, a lifelong Methodist who donated to many causes and ministries during her life. She died in 2007. The conference Global Missions and Justice Committee oversees the program. The annual Lockmiller grant awards to churches and ministries are intended to further children's education by providing food and learning opportunities. For First UMC, Deland, the $2,000 grant will be an opportunity to expand the children's ministry. In July, the church will launch a special respite care program for at least 20 families of developmentally disabled children, ages 5 to 16. Many of the children have been diagnosed with autism. "We understand it will have to have a rolling start," says ministry volunteer Amy Filson, whose background is in nonprofit management. "Twenty is our goal, 20 plus. We're targeting a wide group. It's all developmental disabilities." About 25 church members of all ages will serve as volunteers who will give parents and caregivers "A Night on the Town" to go out and do something fun, such as dinner and a movie. Or they can choose to relax at home while volunteers provide child care. Also, the ministry will hold four "Crowd Parenting" workshops to increase awareness about resources available in the community. The first workshop will be "Three to One," based on a concept of providing three positives for every negative. Filson is organizing the workshop, along with Mimi Lundell, executive director of The Chase Academy, a school for children with autism, and staff members of the Applied Behavior Center for Autism. The Lockmiller grant will pay for printed handouts, refreshments and arts and crafts supplies. "It's going to build a sense of community and demonstrate the church's responsibility to meet their unique needs," Filson says. "We're all God's children, and we have to adapt and provides services to everyone." The training and skills that volunteers receive are transferable to day-to-day experiences in the community, Filson says. "It will teach what are the appropriate things to say and do. It's the idea of awareness. We're just really grateful for this opportunity to fill this need in our community." At Freedom UMC, Jackson feels blessed to bring Camp Hope each year to a community where many families have scarce resources. This is the camp's third summer. But she says, "This is the first time we've been able to use two buses. Last year we had one bus and I put some kids in my car. Transportation is a big problem, and the cost of gas." About eight volunteers help out. This year, campers are putting together a wooden tool box from pre-cut pieces that they sand, glue together and paint. During the week there are $1 movies and $2 swims at a local pool, all paid with grant money. Other activities include fishing at Newnan's Lake, east of Gainesville. "We made bamboo fishing poles," Jackson says. At the end of camp, there usually is a trip to a nearby water park. For the first time, campers not only have Bible study but they are forming a choir. Also, a University of Florida student is working with some campers to improve their reading skills. Amid the fun, Jackson says there are rewards not only for campers but also the volunteers. "It's knowing that if we didn't provide this time for the kids, some of them would be walking the streets and getting in trouble," she says. "We feel good knowing we have a safe environment for the children, that they are learning and they are children of Jesus. We hope we are making a difference in their lives." • Sisters Helping Sisters in Need, Gainesville, for an afterschool program.